This recipe is a variation of making french toast which usually that adds grated parmesan in the usual ingredients for a tasty breakfast. Whisk eggs, milk, minced garlic and parsley. Add salt & pepper. Soak both sides of bread in the mixture. Then press the sides onto a plate filled with grated parmesan cheese so that the cheese adheres on the bread surface. Melt butter over medium low heat in a cast iron skillet. Cook the french toast until golden brown and crisp on both sides. Season with salt & pepper to taste. Garnish with chopped parsley and scallions. Serve and enjoy. 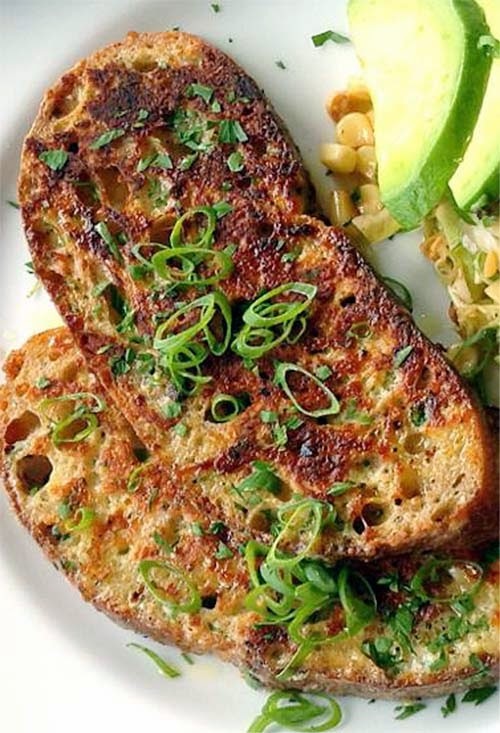 For a more traditional french toast recipe, see here.